I did, I did! 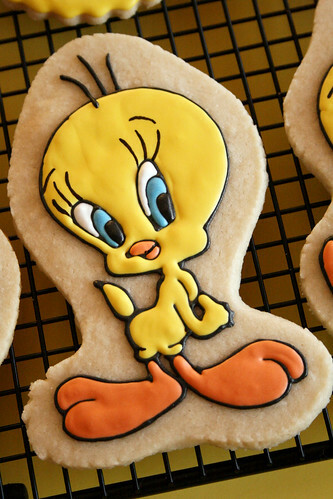 I taw a lot of Tweety Birds! About a year-and-a-half ago, at the urging of my friends & family, I began seriously contemplating cookies as more than just a pastime. Having been a blogger online for years, I also knew that the best way to reach people nowadays is with a website complete with stories, as well as lots of pictures, too. In my case, as a foodie, that involves lots & LOTS of pictures, and recipes from time-to-time as well. It was perfect! I ran it by several friends (who were sworn to secrecy, of course. I didn’t want a “squatter” stealing my name before I had a chance with it! ), and everyone loved it. My mom wasn’t a big fan (I think it held the potential to be a teeny bit crude in her eyes), but I think it’s grown on her over the last year. And I promised Joan that, in exchange for her brilliance, I would send her cookies! Except that, I became so busy so soon, and she was quiet & patient, and then… then I forgot. She had originally said she’d like cookies of my logo, so she could pass them out as extra advertising for me. While I’ve still never actually made any cookies like that, I wanted her gratitude cookies to be something that simply SHE would enjoy, with no strings attached. After all, she’d already done the work for me! 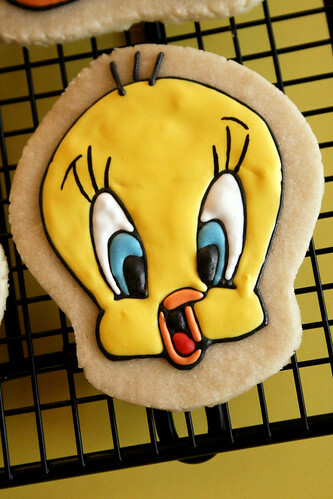 And in case any of the men in her household had qualms about eating a sweet Tweety, I made sure to package a few other goodies as well: some peanut butter cookies, chocolate chip cookies, and my winning White Chocolate Turtle Cookies, too. 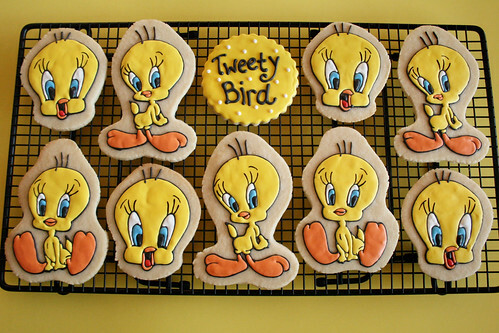 But these Tweety Birds were just so sunny & bright that I smiled the whole time I was making them! I’m smiling the entire way through this post. 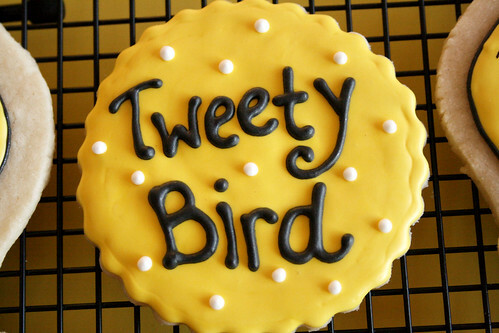 Your Tweety Birds are adorable and I loved hearing how you came upon your blog/business name. I think it is a very clever one and hope you keep it always. oh my goodness gracious!!! 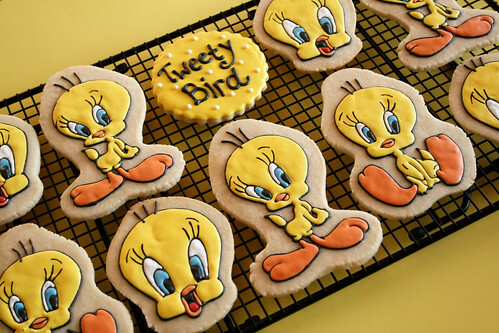 these tweety birds are too cute!!! Thank you, Sarah! I loved him so much myself I didn’t want to ship him away! Wow! Your piping is perfection! Your friend is goong to flip! I love your blog name, thank you sharing the story of where it came from. 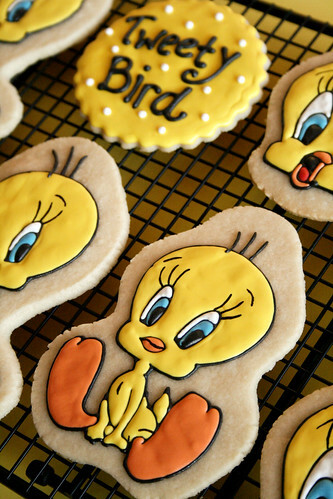 How do I get these cookies? I sent you an email, Carla. OMGGGG i looove your work and it is so crisp and clean. How do you get them to be so precise! you are very talented, keep up the great work. i want t place an order just so i can say i had some cookies from, Lifes a Batch! Thank you! I usually pipe character designs with a size 1 Wilton tip, or a size 0 PME tip. I find it helps me to really get the details in! I’m in love with these cookies. 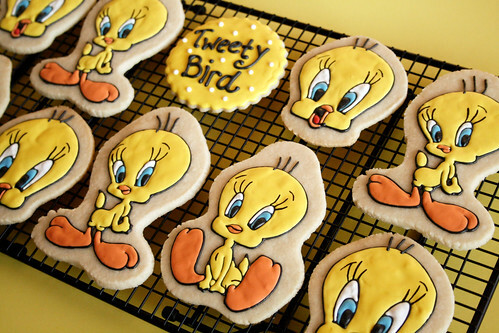 Mainly because i’m a tweety fanatic. You did a great job, keep up the great work! 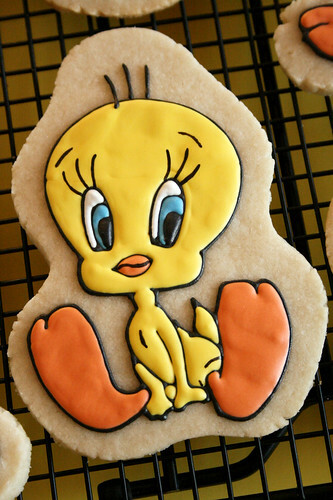 Hi, I would like to know how can I order your tweety cookies please.